Interested in getting in front of thousands of job seekers in one day? Mahalo for participating in the WorkForce Career Fairs! 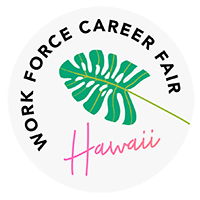 "We send a sincere gratitude of thanks to Workforce Honolulu for their well-organized job fairs. We were able to meet qualified candidates for our openings. With the ability to secure applications, interview AND make contingent employment offers on the same day, we made offers of employment to 35 job fair attendees. Out of that 35, we successfully brought on 21 new hires. I can’t imagine not taking advantage of a momentous job fair such as this one in the future. It’s a win-win for everyone – the employer, the employee and the economy!" Maximize your presence with a promo video and let job seekers know what positions you’re looking for and why they want to work with you! Copyright 2017-2018. All rights reserved - Workforce Career Fair. Design by Hello Big Idea.